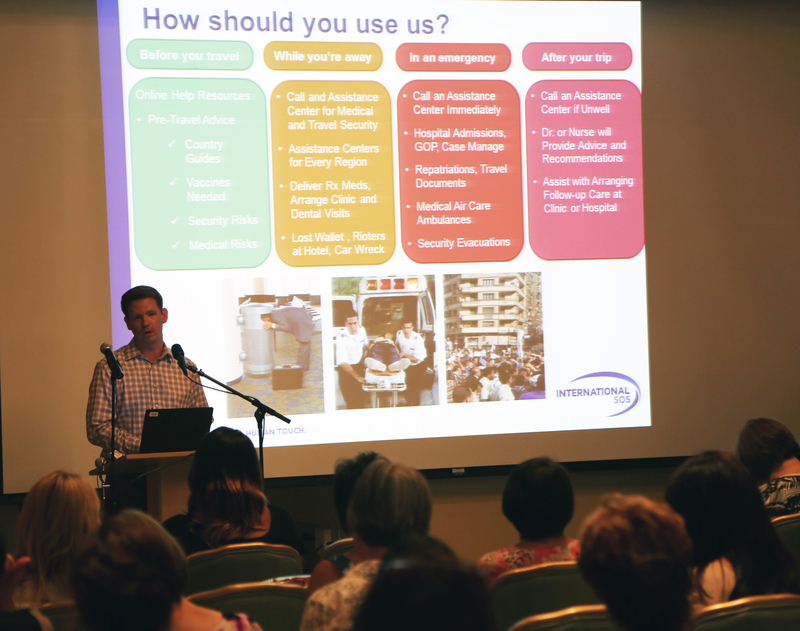 Close to 60 Loma Linda University Health employees and students attended a Global Conversations seminar entitled “International SOS: Travel Safe — How to Mitigate Travel Risk for Health Care Professionals,” on Tuesday, August 1, 2017. Presented by International SOS (ISOS), the world’s largest medical and travel security firm. International SOS specializes in medical assistance, travel security advice and information, emergency services, health care, evacuation and repatriation services. In this course, ISOS focused on how individuals can reduce exposure to and mitigate risks while traveling abroad for work-related and educational endeavors. “We have a moral and legal duty of care to protect our employees and students while traveling on Loma Linda University Health sponsored international trips,” said Raul Castillo, MBA, assistant vice president, department of Risk Management. The ISOS presentation provided attendees with safeguards and plans of action for both medical and security emergencies that may occur overseas. “We hope LLUH will take advantage of the invaluable resource available to employees and students, provided by ISOS through the Global Health Institute,” Castillo said. For more information about the services provided International SOS, please contact the Global Health Institute 909-558-4420 or ghi@llu.edu.